Going through the lock on ones own is not a problem as long as you take it slow and don’t rush things. Even then it only took 20 minutes and I was on my way. First under the railway bridge and off into the River Withern. 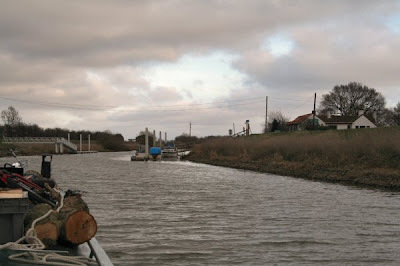 Within a short while there are moorings at Bardney. There is a saying in Lincolnshire. If you leave a door open you will be asked if your from Bardney. The reason for this it is said is when a King – probably Henry VIII – wanted entry to the Abbey they shut the door in his face and so he removed the doors - as you would. With the high flood banks the view is very restricted and the most noticeable thing is the sight of all the rubbish left behind, half way up the trees, about two metres up, after the last time the river was in flood. Rather colder today so when I reached Southery Village and the new visitors mooring there I moored up for five minutes, brewed up and stoked the fire then moved on. The mooring is right next to the old railway station. You will have noticed as you traveled down the river the number of obvious railway styles buildings still in use. Across the river from here is another mooring for the White Horse Inn. Good beer and good food. Last time I was here they had a beer festival on and very enjoyable it was too. I’ll have a look at Southery village on the way back. The footpath has crossed over the river back at Bardney and the occasional sculpture pops into view. The only one that I have noticed. Perhaps there are more but lower in height. I wonder what it represents? The River Withern maybe. At 25 km is the next moorings I will use for the night. Nicholsons guide suggests that the church here is worth a look so will check it out tomorrow.